Have you noticed the emoji's on the Pepsi bottles recently? Pizza Hut wants you to look at them! If you find one with a pizza on it be sure to save it! 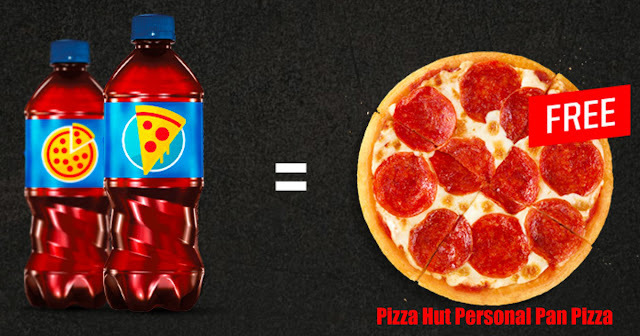 Take it into your local Pizza Hut and it'll score you a FREE Personal Pan Pizza! I'm not sure if this is regional or what is considered a participating Pizza Hut so be sure to give yours a call first to make sure they are doing it! I just found a bunch of Pepsimoji's the other day with a pizza...next time I'll have to grab them up! For more information about this freebie click on the picture below!